The main engine, called Merlin 1C, was developed internally at Space-X, drawing upon a long heritage of space proven engines. The pintle style injector at the heart of Merlin 1C was first used in the Apollo Moon program for the Lunar Excursion Module (LEM) landing engine, one of the most critical phases of the mission. the Service Propulsion System (SPS) was never used subsequent to the cryotank stir/explosion. Because the extent of damage to the SPS was unknown, there was great concern at the time that collateral damage could have caused a catastrophic malfunction (if the engine was fired). Instead the LMDE was used for the return burn and subsequent course correction. Quite a famous engine. Most engines are designed for maximum performance and minimum weight, but we deliberately set out to develop an engine that minimizes cost while retaining excellent performance. We believe this engine will cost 50 to 75 percent less than comparable liquid hydrogen boosters. By reducing engine costs, which make up almost half of the cost of a launch vehicle, we will reduce the cost of launch vehicles and access to space for government and commercial customers. Despite the promise the motor demonstrated, NASA canceled further work. The pintle injector engines have a long history in the former Soviet Union. The NK-33 was the successor to the NK-15 engines used in the failed Soviet N1 Moon launcher. NK-33 have been used with the Russian Proton launch system. An interesting discussion of the Soviet Moon rocket, its engines and the NK-33 successor can be found here, along with spectacular video of the launch and explosion. Orbital Sciences has now contracted with Aerojet (owner of the NK-33 engines) to finish developing and testing the NK-33 engines, now designated as AJ26-58 for the Taurus II. Jonathon Goff, at Masten Space Systems, had a commentary at Selenianboondocks on the 2006 Space-X change from an ablative Merlin engine to a regenerative engine. 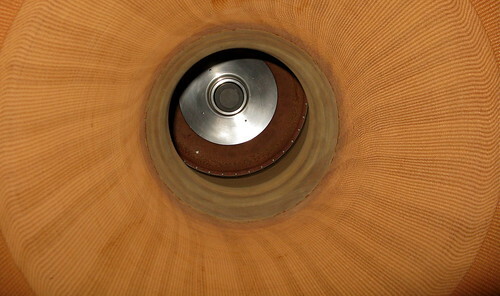 Jon states that the “engine related problems are interrelated, and that they have to do with the combination of using a high chamber pressure engine design with a pintle-injector and an ablatively cooled chamber wall.” That is, the flame produced by the cone of fuel and oxidizer hits the wall of the chamber and overheats the wall. Included in the commentary is a simplified image of a pintle injector rocket engine, which illustrates the flow of liquid oxygen and fuel (RP-1 or liquid hydrogen) through the pintle injector into a cone shaped spray in the combustion chamber. The replacement of the ablative chamber with a regenerative chamber eliminates the overheating. Below right is an image by Warren W. Thompson at the unveiling of Space-X’s Falcon 1 at the Air & Space Museum on 4 December 2003. Finally, while explaining the Pintle Injector to a friend, I realized that almost everybody who has a garden or tends a lawn has personal experience with pintles. You all use a nozzle on the end of your watering hose. Crank it down and you get a steady, narrow stream of water shooting out in a long arc. Crank it back the other way when you want to shut it off, and you get a wide, cone shaped fan spray. Now, turn off the water and look at the business end of the garden hose nozzle (please shut the water off first). There in the middle is a round pintle that moves back and forth as you crank the outer casing one way or the other. And the fan shaped spray of water with which you are familiar is what the fuel and oxidizer spray looks like inside the rocket engine. So take another look at the two images above and imagine the fan shaped spray. The only difference is that your spray of water doesn’t explosively combust and throw a rocket into space. This entry was posted in Rockets, Spaceflight, Technology and tagged Ablative Nozzle, Aerojet, AJ26-58, Apollo, Falcon 1, Falcon-9, Jonathon Goff, Kistler, LEM, LMDE, Lunar Excursion Module, Lunar Module Descent Engine, Masten Space Systems, Merlin, Moon, N-1, NASA, NK-15, NK-33, Orbital Sciences Corporation, Pintle Injector, Regenerative Nozzle, Space-X, Stennis Space Center, Taurus II, TR-106, TRW. Bookmark the permalink.